Jim Howle and Earle "Mr. Clown" Chaney. I've never had the pleasure of meeting Earle but I've met Jim on a few occasions and he's one of my FAVORITE people in the world to talk to. What a great storyteller! 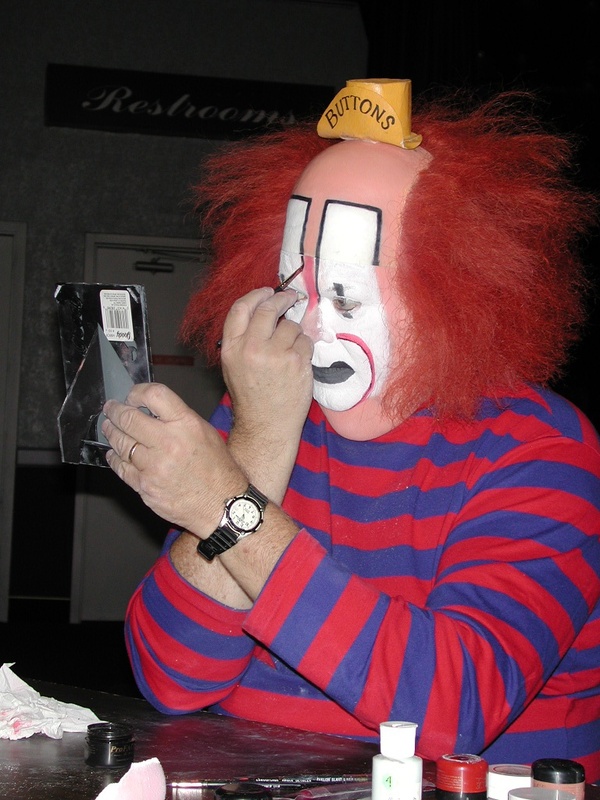 We got to talking at the Clown College reunion in 2001 and were both so wrapped up in the conversation that we didn't realize that almost 2 hours had gone by, everyone else had left and that they'd closed the Adventuredome and we were both now locked in! 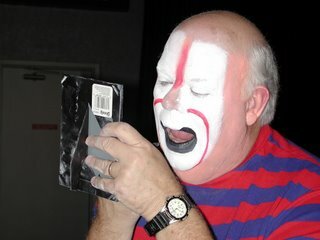 Jim's tramp makeup, which once seemed like such a unique and stylized break with tradition, now (thanks to Russian clowns in Slava's Snowshow, AGA-BOOM, "O", and La Nouba) looks amazingly contemporary and cutting edge! I doubt he has any idea just how avante-garde he is! 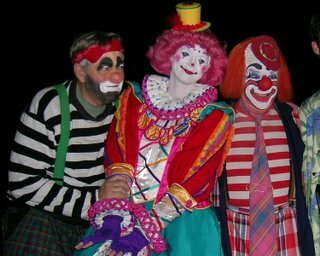 They are joined in the center by someone who deserves a lot of credit, Tricia "Pricilla Mooseburger" Manuel Bothun, a great clown and clown arts educator. 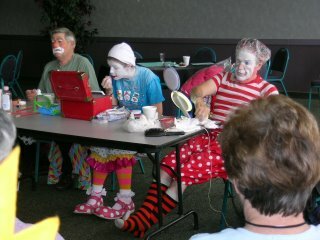 She has helped hundreds of clowns to improves their makeups, costumes and characters through her many educational programs. This just in from my friend John Cooper in the UK. problem is what to leave out! really computerate - but I know a man who is! occurs in connection with Ben Dova (10 and 11 July). the prop, the act and the name from a retired artiste. disappearing in to her trailer. that the humour is very dark at times. worked with her sister Eliane as The Baranton Sisters. I worked a season with Eliane's daughter Sylvana. because he was born in England. I think I asked you a question just now. The transformation of 9' 3" tall Leon McBryde, soft-spoken southern gentleman, into Buttons, alongside Frosty Little maybe the most instantly recognizable of all of the early Clown College graduates. These photos were taken at the WRCA makeup demonstration in 2003. In addition to being a wonderful clown and a master at the art of cicus advance work, Leon is has been a tireless educator to countless clowns throughout the years. 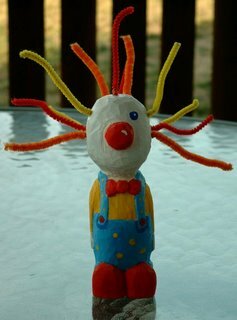 And the man makes excellent clown noses! I wear his Circus Pro CP-XL. I saw this picture today on Buckles Woodcock's outstanding circus blog. It is reprinted here without permission yet because it's early in the morning and I don't want to bother a man like that at an hour like this. This photo is interesting for a few reasons. 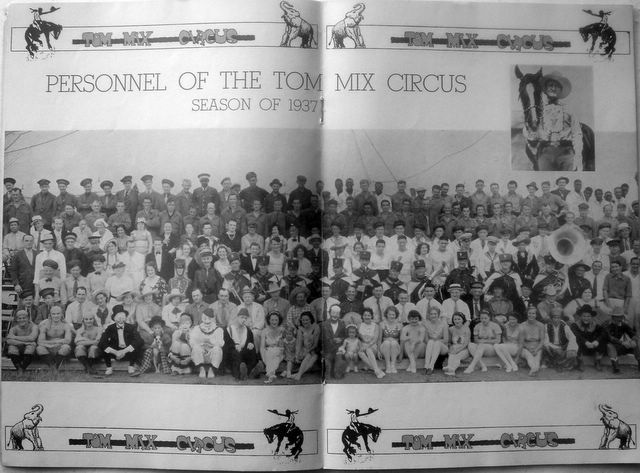 The Tom Mix Clown Alley of 1937 featured quite a few folks that we've seen here before. Somewhere in this photo is the one and only George Carl, early in his career, working in whiteface. By process of elimination, I believe that George Carl may be the whiteface in the front row, four people in from the left of the staples in the center, seated next to Bumpsy Anthony. 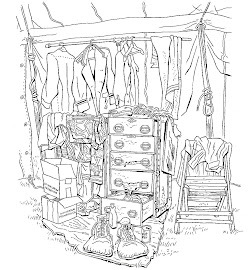 It would be easier if I knew how tall Bumpsy was and could get a close-up of that part of the photo from Buckles but, like I said, I'm not going to be the guy to wake him up! Not a great photo but you should be able to make out Lou Jacobs in an unusual spec costume that seems to be inspired by the Commedia Dell Arte. This photo is from the early 40s and about the time that Capitol Record's artists would be looking through photos for "inspiration". Another early 40s photo of Lou scanned from the Steinmetz book THE CIRCUS COMES HOME. Either Lou never washed his yak hair wig or he was experimenting with a fright wig at the time. 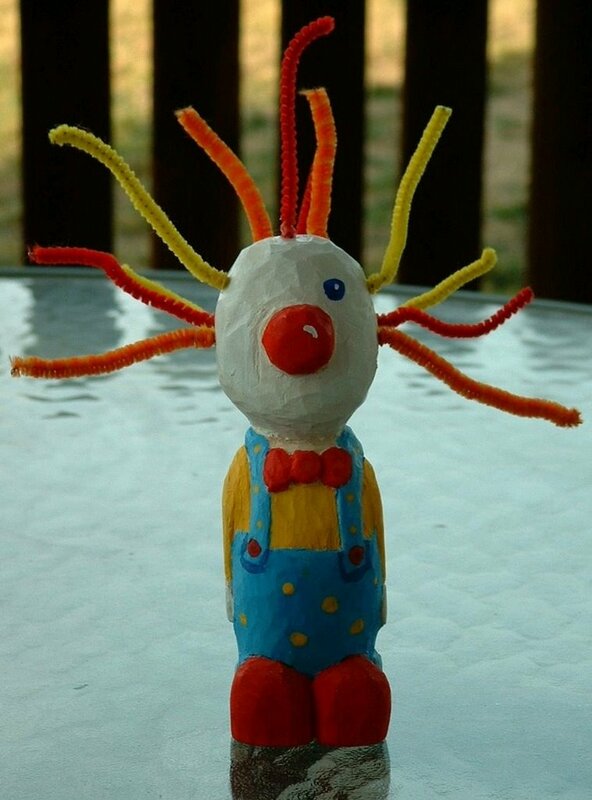 Either way, the face, the hairstyle and the round rubber ball nose are all present in the illustration below. 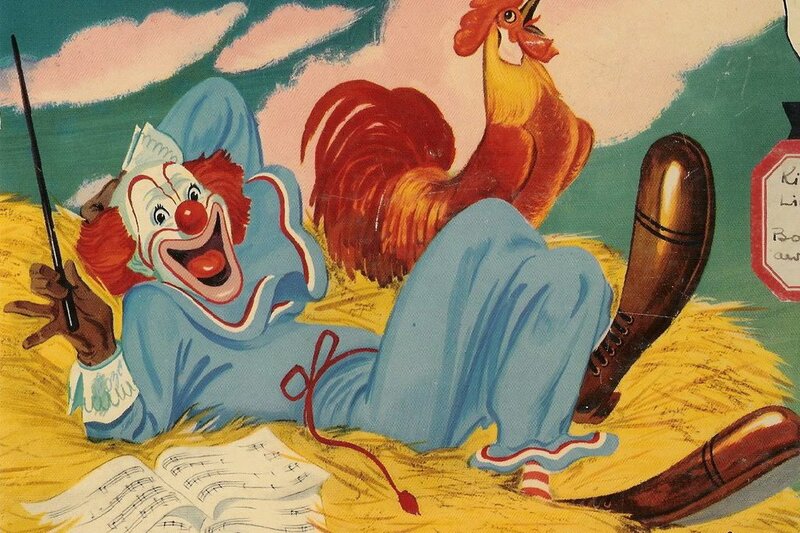 The cover of the Capitol record-reader BOZO ON THE FARM. The makeup, trick wig, rubber ball nose, as well as that spec costume have all been combined to create Bozo the Clown. It's pretty obvious that Lou Jacobs was the inspiration for the design of Bozo the Capitol Clown but I still talk to people who just don't see it. 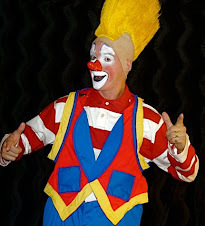 The character that we all know as Bozo the Clown started out as "Bozo the Capitol Clown", was the mascot for Capitol Record's children's division (he was later redesigned after the character was purchased in the 50s by Larry Harmon and became "Larry Harmon's TV Bozo, the World's Most Famous Clown") and was the main character in the very first "record-reader". A 'record-reader" is a book and LP set where actors read the text of the story and let you know when to turn the page. Bozo's record readers were an immensely popular series that ran through the 40s and into the early 50s. They spawned a series of comic books, toys and a few early television shows. 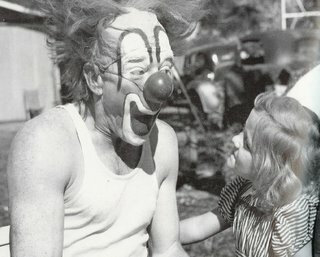 Bozo was played throughout the series by Pinto Colvig, a former circus clown and the voice of Disney's Goofy. How did Lou feel about all this? He must not have minded too much. In the Winter Quarters scene where Charleton Heston walks through Clown Alley early in Cecil B. DeMille's THE GREATETST SHOW ON EARTH you can see very clearly that, taped to the inside lid of Lou's trunk, is a picture of "Bozo the Capitol Clown". Growing up, this clip from Sesame Street (featuring comic and character actor Dennis Allen) was the only instruction that I ever had in the application of clown makeup. It says nothing about powdering and it's all done backwards. It's followed by the two online comments that the clip received. 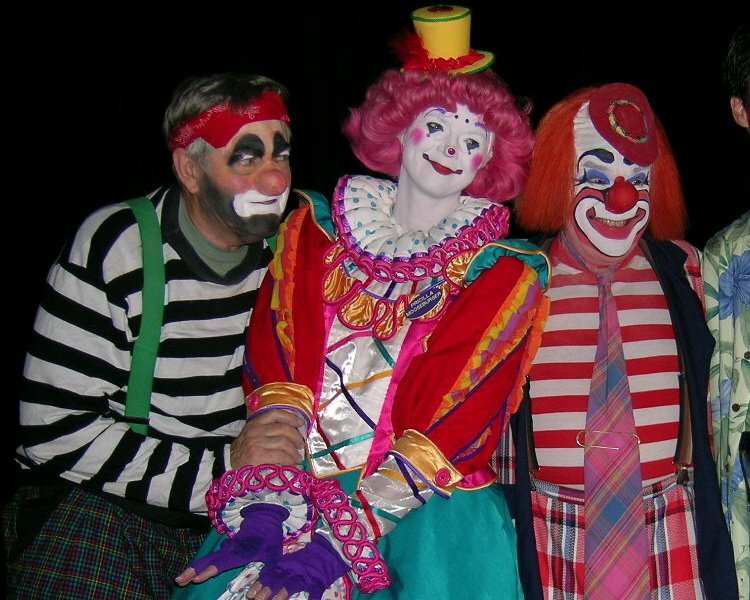 This technically fits the criterea for being "Great CIRCUS Clowns of the Past" as Dimitri Bogatirev toured with Slava in Cirque du Soliel's ALEGRIA and he and his wife Iryna appeared as featured clowns in Cirque's "O" in Las Vegas. They are still clowns, but their circus days are behind them. 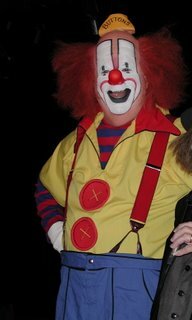 The whiteface character in the show is a Ringling Clown College grad and road veteran, Philip Karp-Briggs. I've been told he's no longer with the show and currently can be seen with his own JUMBO SHRIMP CIRCUS. 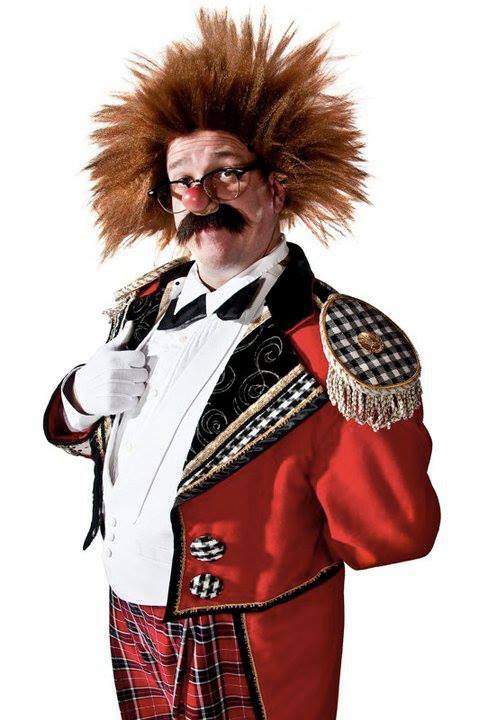 Aga-Boom is a 75-minute family entertainment created and directed by Dimitri Bogatirev, veteran clown of Cirque du Soleil, and produced by his Las Vegas-based Theatre of Physical Comedy and Circus Arts. Aga-Boom (a spin on the Russian word for paper, boomaga) "fills the theater with the laughter, whoops and screams of children and adults alike. Masterly clowning with its own originality. Pure family fun." - The New York Times. 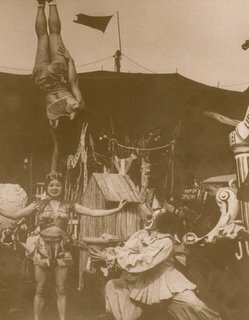 "Came closer to being literally riotous - as in so funny that the audience did more than just laugh - than any theatrical experience within memory. The kids in the audience were on cloud nine, but hardly more so than the adults. Infectiously silly fun." - Los Angeles Times. 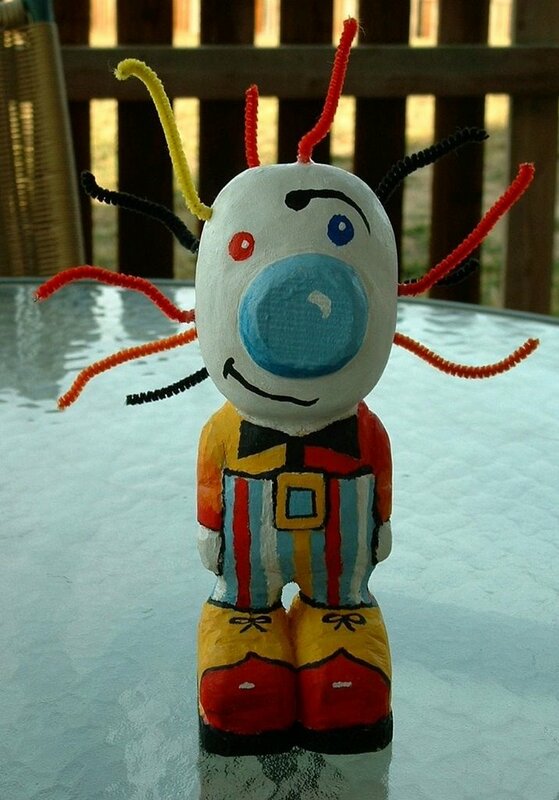 In keeping with our recent Sunday morning tradition of turning the blog over to viewing great contemporary works of clown art, here's some Native American-inspired circus clown art from Cowboy Mike Keever. They thought it was cool.... and especially with some of their artist who are colorist and use the bright colors like I do alot to say what I want to say in my work! 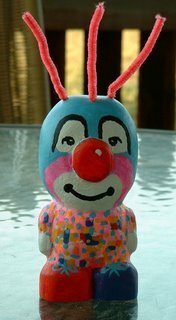 Some may look like certain clowns I know..others are just kind of a tribal looking figure from my imagination.